Because, seriously, Friday is still 2 days away. I love you, Wednesdays is my bloggin' attempt at a.) shutting up about my products and sharing the love of others' with others! and b.) sharing sources of inspiration that often stands behind my jewelry and creative process. Dear faithful readers: I am totally aware that it has been well over a week since I have blogged about anything jewelry related. "Why, Christyn." You may be thinking. "I thought this was a jewelry blog. WTF are you doing blogging about all this other stuff?" Well put, dear reader! I had put some serious thought into this, too, and promise that the next post will be about the handmade wedding jewelry I have been working on all week (though I am also making a birthday cake tonight and just may have to blog about it's fabulousness, too. Just sayin'). Anyway, I couldn't let today go without our I love you, Wednesdays post, now could I? I started taking dancing lessons at the age of three. My mom loves to remind me how I lead the "Booley Bear" jazz troupe on stage in our yellow tutu's and brown fur on our tummies. I only remember throwing my tap shoes off at the end of each practice and melodramatically yelling "Whew, I am beat!" at the ripe ole' age of three. My mom also loves to remind me how I came home mortified one day after practicing on the ballet bar. The girl practicing behind me kicked me in my rear, which was apparently reason enough for me to quit dance all together. Silly three-year-old logic (though seems like drama doesn't really change the older we get, eh ladies?). 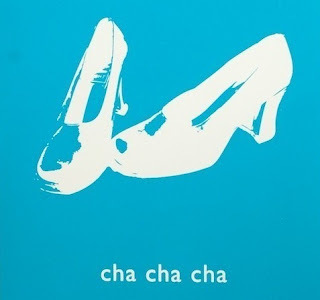 Cha Cha Cha print is from BluLima's Etsy shop! Love it! Anyway, my love for dancing never died, though my talent for it never grew. The outlet I found that best suited me in my love for movement was cheerleading - dancing alone kept me rah rah'in' from grade school through college. I am totally fascinated by all that is dance of any genres, and am currently looking into taking Ballet and Zumba classes here in LA (so long as they are not on Saturday mornings - a girl's gotta sleep in when she can!). Here are a few pictures of me dancing in the ballet slippers I wore on my wedding day - our first dance was what I like to call an improv-ballet-contemporary-piece-of-work. If nothing else it sure did entertain our friends! In the meantime, I'm getting my dancing fix via TV through Dancing with the Stars and So You Think You Can Dance (which I got to see LIVE last Thursday! So totally breathtaking!). I have found that working on jewelry when I am watching either of these shows really sparks my creativity and helps me get in touch with movement in a new way. As a jewelry designer, I am always aware of how the things I make will "wear" on someone, ie how it will move, fall, lay, or dangle on the wearer. Not only does watching how these artists move their bodies inspire me, but it's quite a lesson in physics to watch how their own clothing and jewelry work with their movements! And, let's be honest - isn't some of the jewelry the contestants and hosts wear on these shows absolutely amazing? They are the source of many, many inspirations. Of all the genre's of dance, I am especially fascinated with the beauty, timelessness, and class of ballet. I also especially love toe-shoes (I WILL one day buy myself a pair of real ones, if nothing more than to play in them around my house). I'll admit, though, it was quite hard finding beautiful ballet items on Etsy this week - but the few I did find... stunning. Inspirationally stunning. Be sure to check out their Etsy sites! patriciao82173, Doodleberg, AngelinaMoon, ImagineStudio, emporium51, Emmalynne, CatherineDay. I must admit that I've busted out the "Heisman" quite often. So, perhaps you have a future in dance after all. I used to love dancing. Until it involved getting all pretty and wearing high heeled shoes that make my toesies hurt. At our wedding, I ditched the cute & painful shoes during the ceremony, walked down the aisle barefoot and danced the night away in an old pair of flip-flops!